With a Holiday theme and because I love anything Country, I give you a very simple example of how easy it is to make a Christmas card. 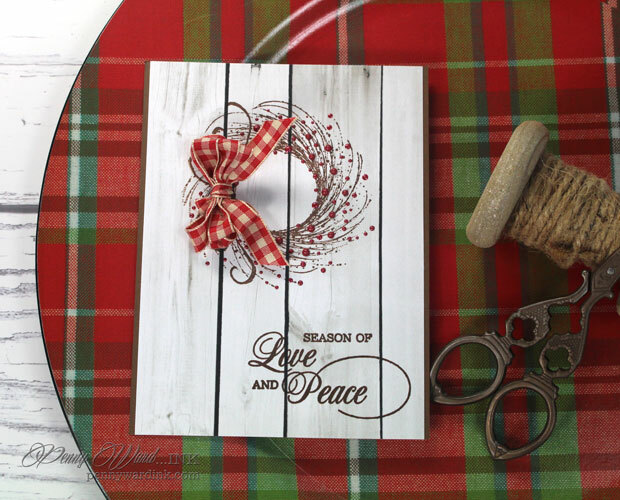 I pulled out a favorite wood stamp by Penny Black called Adornment for the wreath. Added Autumn Red Crystal Drops for the berries. The sentiment from the Love & Peace set also by Penny Black was stamped with VersaFine Vintage Sepia ink. This was the last of my Gingham Ribbon.....I am so sad....I loved it so!!! I mean really...you are already making the holiday card, you might as well enter it into the contest. Love everything about this card! Wishing you and your family a Merry Christmas! Penny, This is absolutely beautiful. Talk about CAS perfection. WOW! Thanks for all you've done for Words 2 Craft By these past few years. We'll miss you, for sure.... so please don't be a stranger. Happy Holidays, my friend! 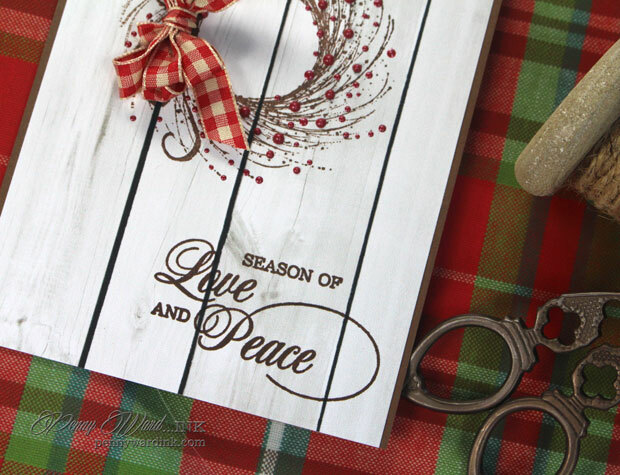 Love how you accented the wreath, and the peaceful feel of the card is perfect for the season. Thanks for being such a wonderful part of Words 2 Craft By!! !